In the beginning, there was nothing but the Lord. The world was naught, null, and nothing; only Tehum which means, “The Formless Darkness“.But the Lord spoke into this Darkness and from within the Lord Himself came out a Word and the Word was “Light” and the name of the Word was Truth. And so the Word of God entered the Darkness and there was Light, and the breath of God on which the Word was carried into the Darkness was Life, and this Spirit began moving and shaping the Darkness. And so, Word and Spirit, Light and Life, began to give form to Tehum, so that Tehum was no more, but was now the World that was, is, and will be. And this is told to us in the beginning of Genesis, and the beginning of John. The Word began creating from what was around Him, and this space where He first came into the world became what we know as the Throne of the Lord, the highest Heaven of Heavens, and out from this came the light which would form Heaven, the realm of the angels. Now, the angels did not begin all at once, and this is important because the older an angel is, the stronger he is, and the more of his brothers the Lord puts under his leadership. The angels did not begin all at once, but they began with one. A single angel, the first of his kind – the first of any kind, for before him only existed the Trinity. The Word spoke and called this angel’s name and from the light of Heaven the angel emerged, glorious, beautiful, and powerful. And this angel was named Heylel, which means “Glorious and Exalted Morningstar, Son of the Dawn”. And the Lord told the Angel that he would go before the Lord into the unformed world to announce the coming of the Lord, just as the Morningstar heralds the rising of the Sun to light the world. No one can say how long this went on, the Lord and the Morningstar forming the heavens, earth, and everything in between. No one else was around to know, the Morningstar would never tell, and the Lord would always ask the questioner “What does it matter how long the Morningstar has been? It could have been a day, but is a thousand years any more than a day to the Lord?” Nevertheless, it came time one day that the Lord saw fit to create brothers and sisters for the Morningstar, and again the Lord called out a name and from the light of Heaven arose the second angel, whom men know as Michael, and in that same breath, the Lord cried a third name, and a third angel Ariel, came forth. Again and again, the Lord spoke names – Gabriel, Uriel, Raphael, Azrael, Camael, Beelzebub, Samael, Rameel, Ashmodai, Mephistopheles… and on and on the Lord spoke names until the whole of the shining light had yielded up each and every angel that would ever be. And the Lord took these first twelve angels, the oldest, who would be the highest leaders of angels, and set them under the instruction of the Morningstar to learn all that he knew. And that is where the angels came from. After the Lord had created every kind of spirit, deity, angel, animal, vegetable, and mineral, He created one last thing. Now this last creation was very important to Him, and He’d been saving it for quite a long time by now. From the breath of the Lord, the same breath that carried the Word into the world and formed the universe, the Lord made this creation in His own image, just as His Word bore His image. And this creature, God gave something nothing else created had: Absolute Free Will. This creature could decide to do anything it wanted that nothing else could for all eternity, even disobey God if it wanted to, although it never should. And the Lord named this creature Adam, which means Man, for all humans were within this Man, except for the ‘Second Adam’, but that’s quite a ways along in the story. The Lord raised up Adam before all of His angels and ordered them to obey, worship, and above all love Adam as they loved the Lord, because Adam was the Lord’s favorite and bore the image of the Lord. Now, Sin is a very peculiar creature. It begins like a seed or egg – simple enough, something that you wouldn’t worry about. But then it begins to grow and grow until it becomes a great beast that lurks outside your door, a beast that all the descendants of Adam would one day have to gain mastery over. But in angels, Sin begins differently, Sin hatches from Pride. There’s nothing wrong with being proud, otherwise the Lord would never give us talents, or success, or families to be proud of. But Pride can come between us and the Lord, especially when we forget that it is the Lord who gives us the things to be proud of, but the Morningstar had forgotten this. As he was greatest, strongest, wisest, oldest, most handsome, and most exalted of all angels, he was also the most proud. Never before had God asked him to love some one so greatly as now. Never before had the Lord told him to bow down to anyone except the Lord. What was Adam that he was so great? He was the youngest being created, he had barely arrived into the world, Adam hadn’t helped God make the world – he, the Morningstar, had. Pride can make people do funny things – mean things – especially when someone’s pride has been offended. We call this pride, when it turns to madness, Hubris, and great was the hubris within the Morningstar that he forgot that it was the Lord who had created him, and so he began to wonder if he would be better at being God if he was allowed to sit on the Lord’s Throne. Michael did not share his older brother’s, his teacher’s, pride. The Lord had given Michael much, and Michael was proud of what he’d been given, and like so many of his other brothers, he loved Adam from the moment the Lord had showed him to the angels. Now, Adam had free will, and could make any choice he wanted. Lucifer had come close to making a choice, but now he was a tempter, now he offered Michael a choice. And for the first time in creation, the Archangel Michael, Prince of the Heavenly Host, made a Choice – the Choice. Many choices we make today, we make with actions, but as the Lord had created the world with a Word, so Prince Michael made his Choice with a word. He looked his beloved older brother in the eyes and said, “Serviam…” which means, “I shall serve Him…” And so Michael turned his back on his brother, and the War in Heaven began. It didn’t take long for Morningstar to tempt every angel in Heaven with the prospect of overthrowing God. Most denied him, choosing to serve the Lord, but there were still those who sided with the Morningstar, and a great many of those there were. If you were to count every star in the universe, a third of this number describes the number of angels who sided with the Morningstar, a third of the angels, or so John’s book of Revelation tells us. The War waged hot and bloody, many angels on both sides died, or as much as an angel can die anyway. But the Morningstar wasn’t afraid to lose his soldiers. He wrote the names of every single angel who followed him, every angel who worshipped him as the new, evil God, on his own wings so that if an angel fell in battle, the angel would rest “in the wings of the Morningstar” and the angel’s power would rest within him, along with the power of every angel who prayed to the Morningstar as God. Now, there are many wonderful and terrible stories that came out of this part of the War, such as the transformation and betrayal of Rameel, the Pledge of Raphael, Uriel’s Triumph, Gabriel’s Taming of the Dragons, and Ariel saving the Earth from Azazel. But the greatest story is the story of how the fighting in Heaven finally ended. The Morningstar, now called Satan because this means “Enemy”, or “Adversary”, had become stronger than he had ever before thought possible. Every angel of his, dead or alive, had given him strength and now he had control over this new found power and had found a way to seize power over all of the angels. On the final day of battle, every angel was locked in combat while Satan remained off the battle field, waiting to hear news of his plans. But Satan’s plans had been thwarted by Michael’s twin brother, Ariel, and news of the failure had yet to reach Satan. This gave the Archangels time to plan, Satan had not confronted them on the battle field yet because he would rather see the angels sworn to him give up their lives for him in an act of devotion, as it didn’t matter to him as their strength was already his. This couldn’t be guaranteed for too long though, due to Michael’s soldiers driving back Beelzebub’s, Satan’s general’s, and troops. As soon as word reached Satan that his plans were failing, he would come and face the Archangels himself, who would most certainly lose. After all, it was the Morningstar who had taught them how to fight; who had taught them everything. Michael then stepped forward. He would go to Satan himself, and challenge him to one final duel to decide the fate of Heaven. At the thought of this, the Archangels protested, surely there must be another way, for Michael would certainly be destroyed the moment he made his challenge. It was Ariel who was the first to relent. Other than the Morningstar, he had known his brother the longest, and he had faith that if anyone could stop Satan, it was Michael, the most faithful and loyal of all angels. He had after all been the first to make a choice. At this there was no more argument amongst the Archangels, and all six brothers blessed Michael and with the company of Heavenly Host, prayed for Michael’s victory. Humans don’t often think that angels can experience miracles. Angels are after all the ones usually working miracles, but there are miracles to angels as well, and that last day of the War in Heaven, Michael experienced one for himself. There is no conceivable explanation for how Michael defeated Satan. In a thousand-thousand-thousand battles between Satan and Michael, Michael still should never have lasted more than a heartbeat. Satan should have slaughtered Michael where he stood, only pausing slightly to mourn the only angel he had ever loved before continuing his march to destroy Heaven and its angels. But by the grace and glory of God, Michael was victorious somehow. And Michael cast Satan out of Heaven, and every angel who had worshipped Satan was dragged down with him. Down they fell, like bolts of lightning crashing to the earth, then deeper into the darkest depths, then deeper still until you could no longer call where they were earth, but some place darker, a place called Hell. And behind them, Michael sealed an unbreakable iron door and locked it tight, so that Satan, the devil, and all of the fallen angels who worshipped him, the demons, were locked inside. 1: What is a demon? A demon is a spiritual being of an angelic nature that has been condemned for eternity due to his rebellion against God. As pure spirits, demons are not made up of matter. Because they do not have bodies, demons are not inclined to any “sins of the flesh” (i.e., it is impossible for them to commit the sins of lust or gluttony) . The sins of demons are exclusively spiritual. But they can tempt human beings to sin in matters of the flesh. Demons were not created evil. (In fact, it is impossible for God, who is Goodness itself, to create anything evil.) Remember: demons are just “bad angels.” After God created the angels, He tested their fidelity to Him before admitting them to the Beatific Vision, the sight ofHis very essence. For purely spiritual beings, this “seeing” of God’s essence would be a purely intellectual vision. Some angels obeyed the divine test; others did not. Those who disobeyed were irreversibly transformed into demons and cast out of heaven. It may seem surprising that some angels would choose to hate God. But we need to understand that those who rebelled saw God no longer as a good-as the Good- but as the oppressor of their freedom. Hate was born as their wills resisted the call of God and held fast to the decision to leave the Father’s house. Now war arose in heaven, Michael and his angels fighting against the dragon; and the dragon and his angels fought, but they were defeated and there was no longer any place for them in heaven. And the great dragon was thrown down, that ancient serpent, who is called the Devil and Satan, the deceiver of the whole world – he was thrown down to the earth, and his angels were thrown down with him (Rv 12:7-9) . How can purely spiritual beings fight among themselves? What weapons do they use? Angels are spirits, so their battles must be purely intellectual. The only weapons that they can use are intellectual arguments. The angels gave reasons to the rebels for why they should return to obedience to God. The rebel angels countered with their reasons to support their position and spread their rebellion among the faithful angels. In this epic angelic battle, some who were inclined to rebel returned to obedience, while some of the faithful angels were seduced by the evil arguments of the rebels. In art, demons are depicted as deformed and grotesque beings. This would seem appropriate given that demons have definitively decided on a destiny far from God. The interior loneliness in which they find themselves forever and their envy of the faithful who enjoy the Beatific Vision continually bring them face-to-face with their sins. They hate God, themselves, and all those who seek to serve God. But not all suffer the same pains. Some angels were deformed more than others in the battle. Those who were more deformed suffer more; the least deformed suffer less. The intellects of the rebellious angels were deformed and darkened by the very reasons they used to justify the rebellion of their wills against God. Their plight is similar to the moral debasement that humans can suffer through sin. We need to remember that we are composite creatures made up of soul and body. Aside from the sins that are proper to the body, the internal psychological process that leads a good person to end up in the Mafia or as a guard in a concentration camp or a terrorist is essentially the same as the sequence of acts of intellect and will that led to the fall of the bad angels. Though we are body-soul composites, we as humans have only to look into our own interior life to understand how we can fall into sin. In this light, the sin of the angels becomes more easily understood. In the case of wings, they represent a state of Divine grace; an angel’s transcendent versatility that allows them to pick and choose which physical laws they abide by in our world. The wings also serve as a sort of communicative ability of angels. When angels touch the tips of their wings together, their power is pooled and they come together to form a single front, as with the Erelim forming their unbreakable unit. And with angels such as Cherubim, as in Ezekiel and the Mercy Seat above the Ark of the Covenant, touching the tips of their wings unleashes a power strong enough to rip through the veil between earth and the Throne to open up a direct channel to God. Last, the wings are a sort of externalized life force of an angel. Samael is called the most wicked angel of death since he stole “feathers” from Michael’s wings during the exile at the end of the War in Heaven, and thereby gained the authority to claim the lives of men. Losing these wings can also bring about a vulnerability, and even a form of mortality to angels. We like to think of angels as immortal, but nothing created can last forever, but just the same, as Philo put it, “Naught which is created wholly dies.” As a matter of fact, angels are not “eternal” beings, as they were at a point in time created by God. They are technically sempiternal, with only God being truly eternal, because He has no point of creation/origin, He simply always was. What happens to an angel struck down in battle is a complete mystery to even the angels themselves. One of the things that makes Lucifer such a sinister master over the fallen is the fact that he wrote the names of every angel who swore allegiance to him upon his wings, as stated above. Whenever Michael or one of his soldiers slew a rebel angel, what remained of that angel was said to “rest within the wings of the Morningstar,” essentially adding its terrible power to the already unimaginably powerful Lucifer. No real way to avoid the pun here, but when it came to striking down a rebel, you were damned if you did and damned if you didn’t. Sure you took a pair of horns off the battle field, but it only made the Morningstar stronger. 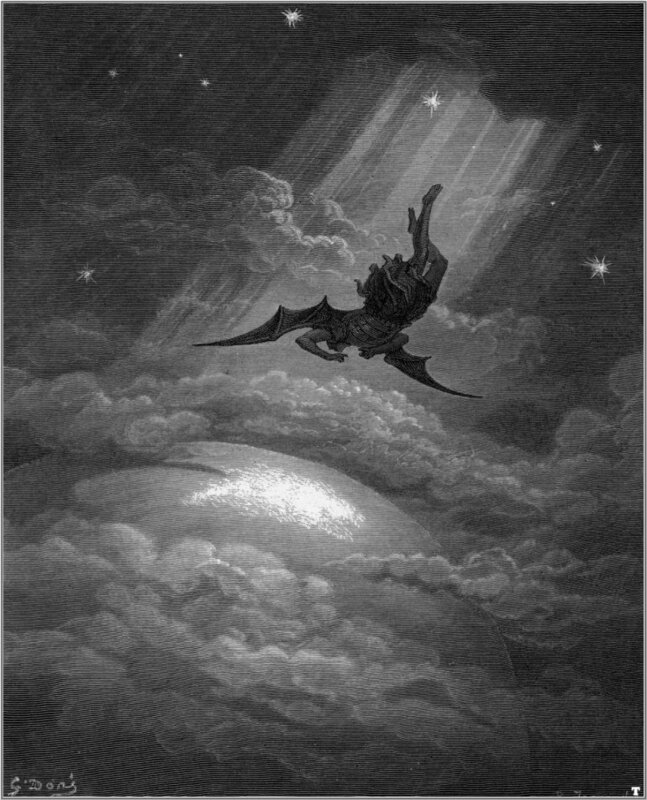 As Lucifer fell, because he had linked himself to all those who followed him, they all tumbled out of Heaven like a prison chain-gang, which is how the War came to a final end. In the 15th century it was estimated that the number of angels who fell with the Morningstar was 133,306,668, over a span in total of nine (9) days according to the Bishop of Tusculum (c. 1273), and was allegedly reaffirmed by Alphonso de Spina (c. 1460). That was very informative, and easy to comprehend. Thank you for this! I’m fairly new to Revelations. I’ve read some of your bio. Perhaps, that is why I was shown your site. for possible, or at least plausible, rationalizations ever since. And here I am. on my website. You’ll find her link there, if you’re interested. If not, no biggie. I enjoyed reading this, you told it the same way my Dad told me as a kid. Good Job dude. But if you could, Please post a link describing Samael that i can actually use. I’ve been facinated by him since childhood. It would really help me out. Well, I actually happen to have a mini specialized library at my disposal. So, what would you like to know about him? Get back to me. Let me know. I’ll see what I can do. Maybe I can whip up a quick article about who he is and what his functions are, as well as his mythology. Honestly? I’d like to read any information you have about him. I want to know his role in both the war in heaven and his role now. His relationship, or status in Lucifer’s army or whatever you’d like to call it. But mostly, I wanna know how powerful he is. Thanks alot. i fancied so much about your niche -angels, demons, everything supernatural!- do you have facebook? add me up! romeoj90@yahoo.com id like to share my views about it and to learned more from you! thnks! 🙂 more power! There was no Bowing to Adam (MAN) but to Bow to Christ who was the one Following Moses before he became Flesh to die for us so that some of us will live. It was Christ who All creation is to Bow to and that caused Satan to make War in Heaven But when Adam was made Lucifer (Satan) wanted to know why he wasn’t told of this before he made War in heaven. From the Beginning It always was Satan wanting Christ’s Jesus thrown and not The Fathers Thrown. He wanted to be Equal with the Father. 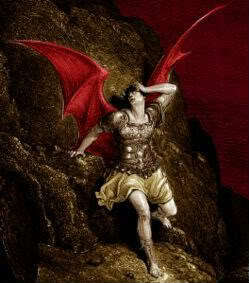 The Father and Jesus Christ Formed the Earth and Man But Lucifer (Satan) was jealous because he wasn’t apart of it all. I don’t like to Read Newer Translated versions of the bible because some words have been changed. I am vary Afraid! Of what I Should say because after Reading 2 Verses in my past. LVCIFER, do you have any explanation why water was before light, as recorded by God? I am sure you remember this also, but admist curiosity few seeks to ask of it. Also, what a blogspot of gold. I hope you have an idea what calibre the information your blog contains, the the calibre of your inquisitive spirit and doings-this is no ordinary strategist presiding here. And if you are aware of it yourself you are even more extraodinary. “Water” is incredibly old and almost universal as a symbol for whatever “exists” before creation happens. Mesopotamian myth, for example, spoke of Abzu, the origin of our word “abyss” and the source of fresh water and ground water, existing before creation with Tiamat, the embodiment of the brackish water of the primordial sea of chaos. Unless I am mistaken, they may both be linguistically tied to a phrase in Gen 1:2 that usually gets translated into English as “Formless and Void”. In Hebrew, the phrase is “Tohu weVohu”. “Tohu” is a cognate or variant of the Tehom mentioned above, as well as “Tiamat” (the “-at” is just a feminine ending, the “Tiam” stem sounds much closer to its cousin, “Tehom”). I believe that “Vohu/Bohu” may in turn have a shared derivation with Abzu, but I’m unsure of that particular link. The reason for the water metaphor is easy enough to understand if you put yourself in an ancient mindset. You have no frame of reference for a Big Bang or a vacuum of deep space or anything, but as you watch the sun rise over the waters and “create” the world with its first light, you begin to picture the moment of creation as being something like that. Just as much, the waters are constantly shifting and unpredictable; the picture of Chaos. The Sun, however, reliably rises the same way, day after day, faithful and true, emerging from a place beyond the horizon and out past the edge of the utter vastness of the waters. If you think of God in similar metaphorical terms, you begin to understand what the inspired people who wrote the Bible were thinking and perceiving as how creation happened. I’ve been richly enlightened, blessed and clarified about some complicating issues from my studies, thanks alot.